Welcome to Our Lake Home on the West Shore of Middle Genesse Lake. Enjoy the Spacious 1.7 Acre Level, Park-Like Yard with Mature Trees. Tell Stories Around the Group Fire Pit Just 15' from The Sandy Shore. You Will Certainly Get the Feel of Being 'Up North' While Close Enough to All the Nearby City Amenities. the Main Level Has a Large, Complete, Eat-in Kitchen; Full Bathroom; Living Room with Fireplace, Cable Television, Couches, Reading Corner; Sun porch with Breakfast Table and Additional Couches and Sitting Area Overlooking the Lake; Additional Room Off Kitchen Area that Can Be Set up with Two Roll-Away Beds to Accommodate Extra Guests. Furnished Deck with Gas Grill. Middle Genesee Lake is One of Only Four Lakes in Southeastern Wisconsin to Have Received an Excellent Rating on Water Clarity from the DNR. This 100 Acre Lake is Large Enough for Boating and Skiing While Still Offering You a View of the Entire Lake from Our Pier. Our Property Offers a Private Launch, Rowboat is Included, Have Paddleboat for Rent. Middle Genesee Lake is Midway Between Madison and Milwaukee, and 100 Miles from Chicago. Many Wonderful Restaurants in the Area Including the Well-Known Fireside Dinner Theatre in Fort Atkinson. This 2 Acre Property is 25 min. west of Milwaukee, 35 min. east of Madison, & 75 Min. north west of Chicago just a mile south of I-94. 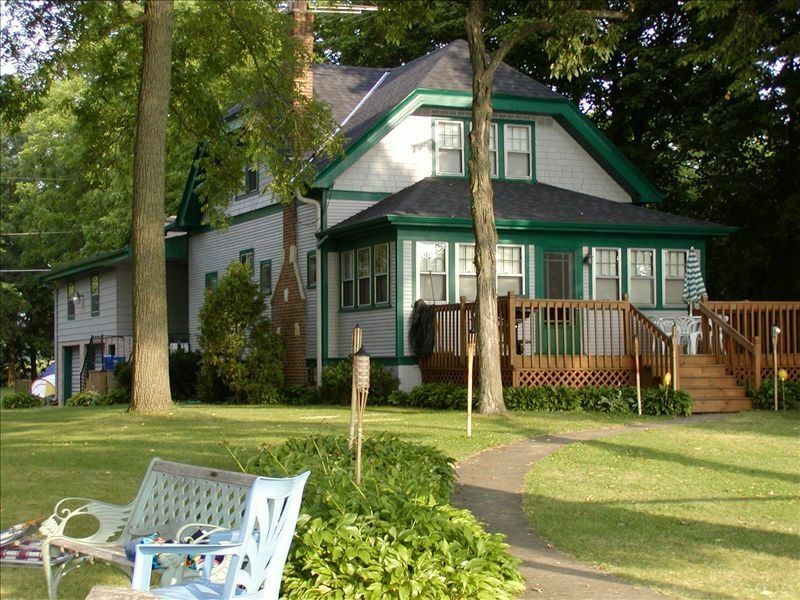 The home is on one of the cleanest lakes in south-eastern Wisconsin. The entire lake can be seen from our shore (yet is large enough to ski on) which is important to us as we have kids who are constantly out on the water. The size of the lot, almost 2 acres, affords privacy, plenty of parking for visitors, and room to spread out. While feeling like we are in an 'up north' setting, the property is close to shopping and a variety of restaurants. In the winter, the lakehouse is perfect for family gatherings; ice skating, ice fishing, cross-country skiing and Olympia Resort is only 1 mile away for downhill skiing! Very well appointed cabin. We were very comfortable here and found the cabin to have plenty of room for everyone. Lake is weedy, but that means it's clean. We found the deep side and took our rented pontoon to that side and floated and played in the water there. Plenty of room outside to play, eat, have a fire and swing. Vicki and Tom were very responsive to our texts and emails. Nice people! This is a beautiful property with lovely, accessible lake frontage and dock, sandy shores, clear water, and plenty of fish. Our family had a fantastic vacation and the home was clean, and well-appointed. The boat rental options make for a fabulous stay and the size of the lake is perfect for human-powered crafts. We were able to see where our kids were at all times when they would kayak or canoe around the lake. A beautiful and relaxing spot with responsible and attentive owners! The pictures just don't do this place justice. I really enjoyed saying here. I enjoyed the house, the bonfire pit, everything was included. Rooms were huge, and furniture was clean and nice. We rented the Pontoon for an extra $500 for 4 days. The yard to water doesn't have a lot of steep stairs, so it was good for the father in law who had trouble walking. I'd like to bring my dogs next time. We'll be back for sure! What a great place my family and friends had a great time. The house has everything you need, the yard is big and provides plenty of space to play. My dogs had a great time swimming in the lake. The lake is beautiful despite the low water level due to the drought. Very private and quiet. The best part is it's location only took me a short time to drive home. Would love to come back again! This Kettel Moraine Area is Well Known for its Bicycling and Motorcycling.